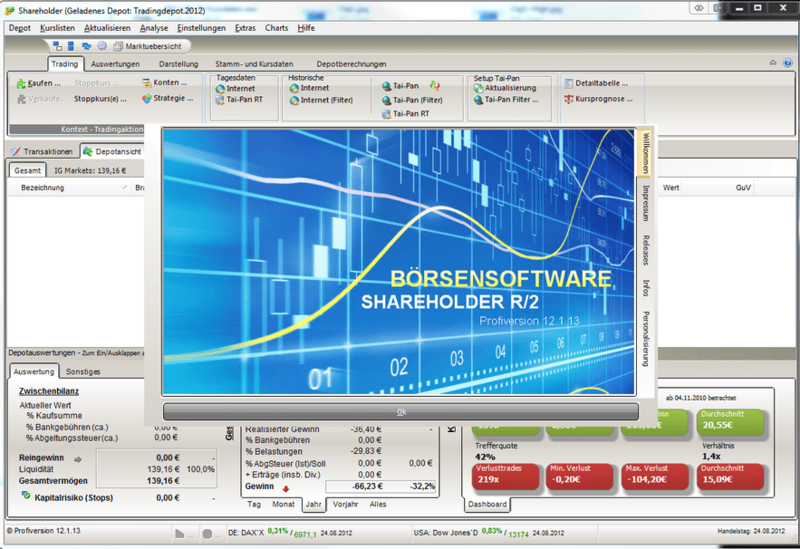 Shareholder R/2 ist eine Boersensoftware die eine einfache Bedienung (Office 2007-Bedienung, Hilfesystem) , umfassende Moeglichkeiten hinsichtlich Aktien-Markt-Analyse und Geld-Positionsgroessen-Management, sowie der Integration von professionellen Funktionen (Candlestickerkennung, Neuronale Netze, Automatische Handelssysteme, Optimierung mit biologischen Verfahren/genetischen Algorithmen) bietet. Die Software unterstÃƒÂ¼tzt dabei Anleger, die Hilfestellungen fÃƒÂ¼r Ihre Boersenanlagen suchen. Generell wird dabei mit einfachen AnsÃƒÂ¤tzen begonnen und nach Bedarf zusÃƒÂ¤tzliche Funktionen hinzugenommen. Hauptziel ist die einfache Verwaltung des Depots und die UnterstÃƒÂ¼tzung in der Anlage-Entscheidung (z.B. durch Analysen von Fundamentaldaten, Candlesticks, Chartdaten oder Marktentwicklungen).Die Software wird dabei einmalig lizensiert und es koennen freie und kostenlose Kursaktualisierungsangebote genutzt werden. CommonCents is the best budgeting and personal finance software available. It's packed with powerful features: automated transactions, checkbook-style registers, account reconciliation, password protection, detailed financial reports, and much more! Shoppingmate - Total Grocery Shopping Management System (TGSMS) Family Budget Software Go shopping with Shoppingmate! CreditFederal.com Bill Pay Reminders 1.0.0.0. CreditFederal.com Free Bill Payment Software reminds you when your bills are due so you can make timely payments without forgetting. Use it to remember other important dates, too. This program is arranged in an updatedl lending institution format. Although it may not be in the format required by any given institution, it provides all the information necessary for completing an actual financial statement. Living payday to payday? Can't get out of debt? Finances in a mess? Try a better way to manage your checkbook. Budget is based on the tried and true "Envelope" method of budgeting - a much easier way to see where your money is. The Expenses Manager makes it easy to analyze home expenses and find savings in home budget. A personal finance add-in to Microsoft Excel. It automates importing your bank statements into a spreadsheet, allows you to monitor your expenses by categories and make budgets. It is an easy tool for taking control over your finances. Keep track of what you pay for groceries (or practically anything you buy on a regular basis), so you can determine the best price and best time to buy for each item. This spreadsheet allows you to have lists of categories for use in drop-down menus. A promissory note form is a legal written promise to repay a loan or debt under specific terms. This is usually upon demand or at a stated time, through specified number of installments. An extremely easy and powerful tool to create a simple budget that you can use to track your monthly bills, loans, expenses and creates a time line for you to pay off your debt. This site does not contain serial number, crack, keygen Shareholder R/2 serial number : serial number is the simplest type of crack. A serial number(cdkey,product key,etc) is register the program as you may already know. a crack or keygen may contain harmful software. If you cannot find the exact version you want, just give it a try. for more information read .nfo/.txt/.diz file include in zipped file.